How long since you haven’t updated your bio on Instagram? Well, you might want to do that right now, as the company just announced it’s now allowing subscribers to add hashtags or profile links to their bio. To add a hashtag to your profile bio is super easy. The live links will take your followers or any other Instagram users who visit your profile to a hashtag page or another subscriber’s profile. Users can link any hashtag or profile they want in their bio. However, the owners of the account you mention will be notified that you’ve linked them to your profile. For privacy reasons, Instagram is also giving them the option to opt out. Which will keep their @profile name on your profile, but it won’t be a clickable link to their Instagram account. Instagram is currently rolling out the new feature for both Android and iOS users. So make sure you have the latest version of Instagram on your phone. Or download the app from the Play Store. 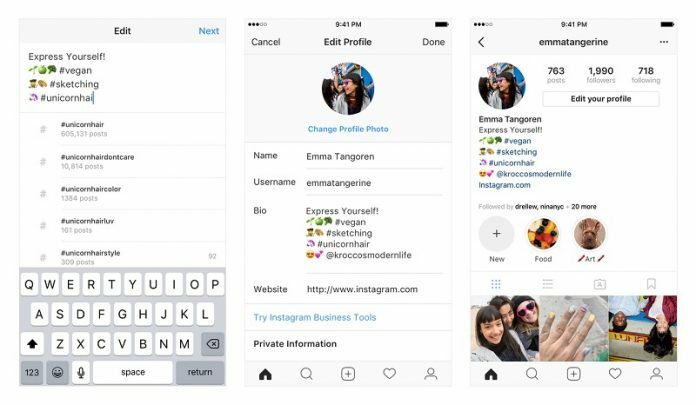 Instagram is constantly adding new features to its app. Last month, the photography app welcomed a new option which allowed users to add text-only posts in Instagram Stories. And in recent days a few lines of hidden code revealed that Instagram is gearing up to include video and voice calling. It’s not a big surprise that the company is looking to add this new feature. After all, one of its main competitors, Snapchat has had video calling for some time.